Public exhibition of the road proposal by the National Parks and Wildlife Service, which included details of a proposed illegal land dealing to facilitate a gift of land to the Minister for the Environment, has now closed. 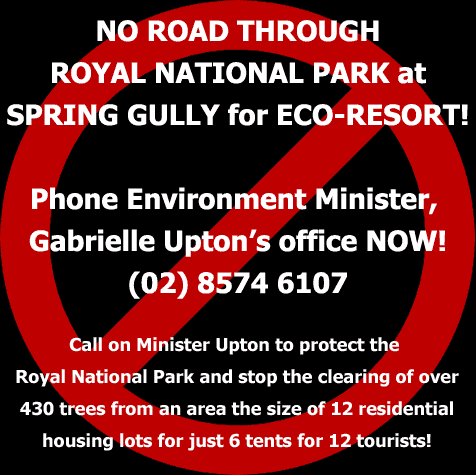 Please phone Environment Minister Gabrielle Upton’s office directly and call on Minister Upton to protect the Royal National Park and stop the clearing of over 430 trees from an area the size of 12 residential housing lots for just 6 tents for 12 tourists on the former Scout land. No road through Royal National Park for Spring Gully ‘eco’-resort! Phone Environment Minister, Gabrielle Upton’s office NOW! (02) 8574 61074. 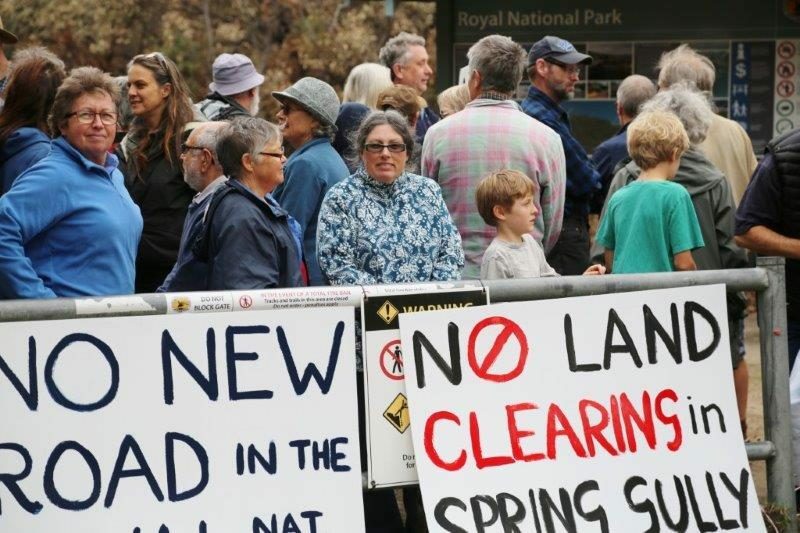 I object to the proposal for road access via the Royal National Park (RNP) to the proposed Bundeena Coast Eco-lodge recreation camp as exhibited. The proposed activity is located in an area of high bushfire risk. The proposed road cannot provide safe evacuation or access by emergency services during a bushfire (paragraph. 101, RVA Australia Pty Ltd v Sutherland Shire Council, Land and Environment Court, 2017). The proposed Asset Protection Zone (APZ) and refuge building do not attain the new standard of a maximum 10kW/m2 radiant heat exposure for a fire refuge as specified in the draft RFS Planning for Bushfire 2017 development controls. The proposal to retain the locked gate at the Beachcomber Ave entrance (REF pp 16, 23, 32, 42, 52, 60) does not satisfy the Rural Fire Service (RFS) Bushfire Safety Authority dated 25/01/17. Condition 5 states that the road must meet RFS public road standards and condition 6 b) vi) specifies that access must remain unobstructed at all times during occupation. The area is currently unoccupied. Increasing human activity through permanent occupation, tourist accommodation and regular vehicle access will increase bush fire risk. In the case of a bushfire or other emergency, the proposed activity risks creating traffic conflicts that could impede NPWS and emergency services operations at the Coast Track entrance which already experiences high vehicle and pedestrian traffic. The proposed activity will also adversely impact bush fire hazard reduction operations within the Spring Gully Strategic Fire Advantage Zone, especially the location of containment lines. Both the RFS Bundeena Brigade and Sutherland District have requested that the proposed eco-lodge development be refused. Many RFS volunteers are local residents and the community holds a high concern for their safety. The RPS Ecological Assessment, Oct. 2014, provides no assessment of the site of the proposed access road or the proposed works, including the APZ, on the Sussex St road reserve. Not only does it limit the study area to the boundaries of 60-70 Bournemouth St, it provides no assessment of the ecological impacts of the proposed permanent modification of vegetation within the Fuel Reduced Area (FRA). Furthermore, several iterations of amended site plans have been prepared since the RPS Ecological Assessment and the size of the APZ and number of trees to be cleared in the study area has increased significantly. The findings of the RPS ecological assessment, including the Assessments of Significance (Appendix 7) and Significant Impact Assessments (Appendix 8) are inadequate as they do not provide a full assessment of the site of the proposed activity, or an appropriate study area that includes the full extent of direct and indirect impacts, as required by the ‘Guidelines for Preparing a Review of Environmental Factors’, OEH, Aug. 2016 and the ‘Threatened Species Assessment Guidelines’, DECC, Aug. 2007. The Ecological Impact Assessment, Cumberland Ecology, February 2016 states that “No vegetation is proposed to be cleared from the FRA”. This is contradicted by the Plan of Management, RVA, May 2017 which states that all ground-cover within the FRA is to be mowed and raked (pp27-8) and vegetation pruned (p28) through daily maintenance (p39). The ecological assessments undertaken involved inadequate survey effort. The RPS survey effort was limited to random meander to determine the presence of endangered ecological communities (EECs), their extent and boundaries. The Cumberland site assessment was limited to a walk along the proposed access track and limited areas within the development site conducted following the bushfire hazard reduction burn of August 2015 when much of usual composition and structure of the ecological communities would not have been visible. The proposal exhibited provides no assessments of significance for Eastern Suburbs Banksia Scrub, Swamp Sclerophyll Forest, Coastal Upland Swamp, Sand Bangalay Forest or Kurnell Dune Forest EECs. Of particular concern is the failure to assess direct impacts from clearing Eastern Suburbs Banksia Scrub from the proposed road, APZ and building footprint as alerted to by David Keith, Professor of Botany, UNSW and Senior Principal Research Scientist, OEH. For the reasons outlined above, the proposal also fails to provide adequate assessment of impacts to Broad-headed snake, Swift parrot, Powerful Owl, Giant Burrowing Frog, Eastern pygmy-possum, Rosenberg’s goanna, New Holland Mouse, Australiasian Bittern, Large-eared pied bat, Red-crowned toadlet, Greater broad-nosed bat, Little Lorikeet, Eastern Bentwing-bat, Varied Sittella, Black Bittern, Grey-headed flying-fox and Beautiful Firetail. The potential impacts from disturbance and road-kill to the above fauna species, especially at night, has not been adequately assessed. Nor have potential impacts to Red-crowned toadlet, which is known to inhabit the stream that the proposed access road crosses, been adequately assessed. The proposal does not address the RFS requirement for the access road to be a public road, unobstructed at all times the facility is occupied. The estimate of one or two daily vehicle trips during both construction and ongoing operation of the recreation camp (which includes a caretaker family residence) is unrealistic and not likely to be enforceable given the RFS requirements (REF pp 3, 11, 42). The proposed facility includes four guest parking spaces in addition to the two garaged mini-buses, utility vehicle and caretaker vehicle proposed which suggests traffic will be higher than indicated in the REF (REF p 23). The Bundeena entrance to the Coast track, which is directly in the path of the proposed access road, is the busiest track head in the RNP. The proposal fails to adequately and realistically address bushwalker safety, impacts to traffic and the resultant impacts to the amenity of local residents from the likely level of traffic. The proposal claims to satisfy s153C of the National Parks and Wildlife Act (NPWS Act) by offering five hectares of unmade roads for inclusion into the RNP (REF, pp. 11, 12, 30, 43). The applicant provides no proof of ownership of this land. In fact, the NSW Parliament was informed in July 2016 that NPWS was already working with Sutherland Shire Council to incorporate the unmade roads into the Park. The proposal has not adequately assessed the potential impacts to all species and ecological communities relevant to the site and subject area. The proposed activity increases bush-fire risk. The proposal has not provided a realistic assessment of the likely impacts to amenity of park users and local residents, especially bushwalker safety. The proposal does not meet the purpose of National Parks to conserve biodiversity and ecosystem function, ecological integrity and the natural values of the park as defined in the NPW Act.